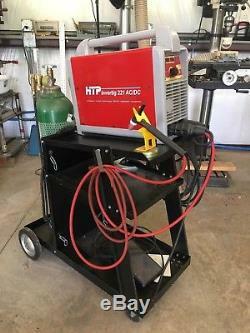 Lightly used HTP Invertig 221 Tig / Stick welder with stand, gas bottle (owned), extra torches with lots of accessories gas lens, stubby torch back, electrodes, etc. 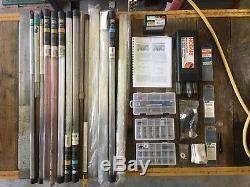 , a lot of tig rods, stick rods, tig fingers, manual. I also have a tungsten grinder I can include. 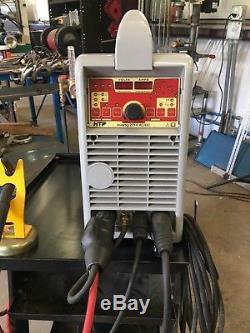 Invertig 221 AC/DC Inverter TIG welder. 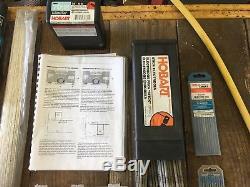 Will allow you to produce welds with all types of metal! We increased the maximum welding current by 10% to a full 220 amps of rugged welding power. And we put the machine on a diet, the HTP Invertig 221 weighs in at only 40 lbs, so its easy to take right to the job! The Invertig 221 is packed with features many of our competitors. 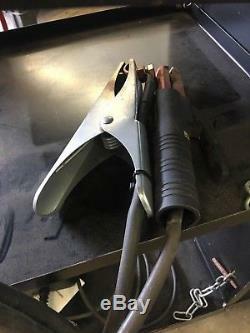 Its the only welder in its class with independent AC amperage adjustment. This feature gives you precise control over the heat input to both the workpiece and the tungsten by allowing you to separately adjust the electrode negative and electrode positive amperage. Conventional transformer TIG welders have a fixed AC frequency of 60 Hz (same as your household current). They use a pure tungsten electrode which forms a ball when welding AC. The Invertig 221 offers you the. Ability to adjust the AC frequency from 20 Hz to 200 Hz the higher AC frequency gives you a more focused. Arc with greater arc control. With an inverter, running a higher AC frequency, say in the 150 Hz to 200 Hz. Range allows you to use ceriated, lanthanated, or thoriated tungsten sharpened to a point. Allows the arc to jump from a point instead of. A ball, which provides unparalleled arc stability. Produces a more focused arc, resulting in a. Narrower bead and making it much easier to. Minimizes the heat affected zone as the heat. Is more concentrated, making it easier for both. 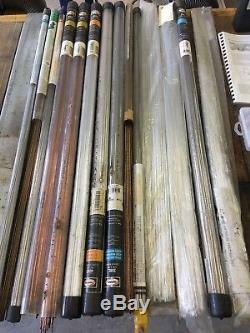 The novice and professional to weld thin materials. The 221 also gives you precise control over the. AC balance (from 10% to 90%) so you can. Control the arc cleaning action. The 221 is also an excellent DC welder too. The smooth, stable arc coupled with the 221s high speed pulse. DC pulse make intricate work on mild steel, 4130, stainless, inconel and titanium a breeze. Pulse focuses the DC arc much like the AC balance focuses the AC Arc the end result more control. With a pulse rate of up to 999pps, there isnt a job out there the 221 cant handle. Lets face it, control of the arc is the foundation of better welds and precision results. Independent AC amperage adjustment, adjustable AC frequency, adjustable AC balance, and high speed. DC pulse, the 221 gives you arc control like you never before experienced. The 221 allows you to store up to 64 separate welding programs. So, say you found a setting you really like. For welding aluminum radiator tanks to cores. AC On, HF On, Max Current = 180 amps, AC Balance = 65%. AC Frequency = 180 Hz, EP = 60%, Pulse Freq 1 Hz, Peak Time 80%, Background Current 30%. Store this program and you can come back to it when you have another tank to core job. Of memory slots to multiple welders allows them to access their personal settings in a job shop environment. 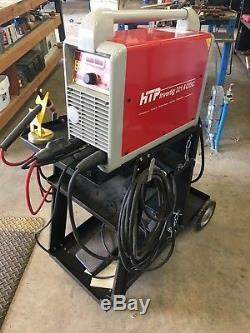 The item "HTP Invertig 221 TIG Stick Welder with Stand, Gas, rods, torches, tungsten, & more" is in sale since Friday, September 28, 2018. This item is in the category "Business & Industrial\CNC, Metalworking & Manufacturing\Welding & Soldering Equipment\Welding\Welders, Cutters & Torches\TIG Welders". 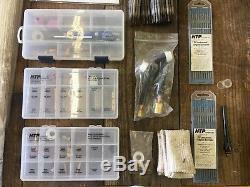 The seller is "mitzngeoff" and is located in Vero Beach, Florida.